The journal’s previous title was Sovremennye issledovaniia sot︠s︡ialʹnykh problem = Sovremennye issledovaniya sotsialnykh problem = Modern Research of Social Problems (ISSN 2218-7405). 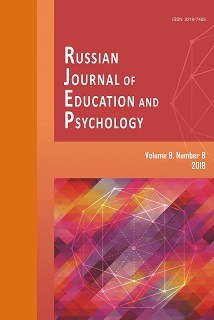 Russian Journal of Education and Psychology is a specialized academic peer-reviewed journal devoted to the topical problems of the life of the Russian society and presenting the results researches of scientists of the post-Soviet space and foreign researchers. The journal has been published since 2009 by the Science and Innovation Center Publishing House. The journal is administered by the Professional Educational Organization - Private Institution "Higher School of Social Relationships" (Krasnoyarsk Region, Russian Federation). At the end of 2015, Russian Journal of Education and Psychology was modified. Since that time, the journal has been updated, which affected not only its design, but also the editorial board and reviewing staff, editorial policies, topics and principles for the selection of published articles. The members of the editorial board are acknowledged Russian and foreign scientists, who actively participate in the formation of the international profile of the journal. The journal focuses on an interdisciplinary dialogue of representatives of social and humanitarian knowledge. The journal focuses on publishing studies of problems of educational space, psychological structures and social values of Russian society. We do not rigidly limit ourselves within the Russian scientific framework and publish papers based on a wide scope of comparative material. The journal works for becoming a platform for publishing new breakthrough research works, carried out using a comparative study of the materials obtained from all around the globe. The mission of the journal is to unite scientists’ research efforts aimed at studying topical issues of Russian society, considered in the prism of the specifics of the organization of its educational space, psychological structures and social values, as well as contribute to discussion and popularization of this field of knowledge by providing open access to published articles. The importance of the problems modern society is facing has been consistently discussed not only in the academic discourse. Therefore, in addition to the academic audience, the journal is also aimed at non-academic readers interested in discussing the fundamental problems of modern society and social and human sciences. As the journal is working for becoming a platform for full-scale discussion of these problems, it follows the policy of open access to its publications. All contents of the journal are available free of charge to its users on the journal's official website upon publishing the issue. The users are allowed to read, download, copy, distribute, print, search and find full texts of the published articles without the prior permission of the publisher or the publication’s author. Both the full-scale discussion of problems and open access policy suggest that the journal is ready to publish not only original scientific articles in Russian and English on the results of fundamental and applied-theoretic research in the field of psychology and pedagogy, but also review papers made by leading specialists in the fields of knowledge related to the profile of the journal as well as professional reviews of new books and scientific research, materials of scientific events, discussions and round tables devoted to the issues covered by the journal. Russian Journal of Education and Psychology is registered as an online edition (certificate of registry PI № FS 77-74551) by the Federal supervise service of connections, information technology and mass communications (Roskomnadzor). Since 2017, an electronic copy of the journal is submitted to the Information Telegraph Agency of Russia (TASS) and the Russian State Library. The published materials are also kept in the editorial office of the journal, which ensures both the permanent deposition of published scientific articles and their availability. Articles publishing in the journal Russian Journal of Education and Psychology was is carried out in accordance with the Creative Commons Attribution License, CC BY-NC-ND 4.0.